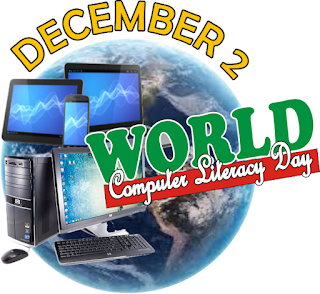 Every 2nd of December, 2016 is set to be “World Computer Literacy Day,” despite the fact that we all deal with computer every day, few people recognize this day, not to talk of celebrating it. The problem is not far fetch, people in the underserved community constituting the majority population of any country mostly the developing nation’s lack access to this facility. The question is, are they lacking in terms of financial resources to acquire it or they lack the orientation of having one? In reality, if they could afford a TV set then I think they have the resources to have a computer system, the problem is, they lack the orientation of given their children the computer education. Operating a Basic Computer Skills and Services Centre gives me the opportunity to know that just as academic literacy takes time to be wholly accepted among the masses, so also the Computer education. Today, parents preferred the academic literacy over the computer literacy up to university level. Of course I am not disputing that, after all, if you cannot read and write how do you operate computer system? But if you ask me, I think both should go hand in hand just like financial expert also advocates for financial education. We’ve all heard a lot about the industrial age in relation to academic education. The ability to read, write and communicate is the initiation behind the industrial age. There have being lots of amendment and improvement, but none has being able to meet up with what is required at this age. Except of recent when I heard that Finland is reforming her educational system by eradicating teaching by subject replaced with teaching by topics. Quoting Liisa Pohjolainen, who is in charge of youth and adult education in Helsinki – the capital city at the forefront of the reform programme. “What we need now is a different kind of education to prepare people for working life. This is what the World Computer Literacy Day is all about, to orient both the authority and the parent on the important of computer literacy in achieve their future career. I am aware that Computer education has been included in school curriculum, but it is still being treated as unimportant, moreover, they are being taught on paper (theory). The most sadden one is the colleges and universities in many developing countries. Imagine someone who is studying Computer Engineering or Science as a major course that cannot be apple to boldly operate computer system not to talk of assembly it. I think people at this level should be using computer system and programme to find solutions to the nation’s problems, instead they are learning what they are suppose to know why in the elementary school. The claim is that there are no facilities for the practical, I doubt if this claim is really true, the problem I think is putting the square peg into the round hole. Majority of the authority and lecturers are laggards who have no interest in these things, lack the required know-how and are not read to update their knowledge. If people with little or no financial resources operation 10 x 12 square metre office as a training school can teach their students on computer repair and maintenance, assembly, WLAN and LAN networking, Coding etc then I don’t think these authorities will have anything to back up their claims. I have come to realise that, one of the major challenges of developing nations is that their ability to step up to what is required to compete with the rest of the world. When you see any economy dragging, check their willingness to accept innovation and new technologies. I said willingness to accept, not the resources to acquire. Whether we like it or not, computer and its related devices has come to change the way we do business and how we relate with ourselves personally. Before you start complaining of unemployment, start asking yourself, am I computer literate. Many people jobless today would have find alternative to their unemployment problem if they have basic computer knowledge and skills. The reason is that in this age and with ability to work effectively with computer system. The resources required to start out as entrepreneur is minimal, even if it is just given out the knowledge about what you know professionally or what you are passionate about. That is enough to raise the capital required to physically start out. It is now upon us who knows about this to start orienting those who do not as our contribution to the world development.